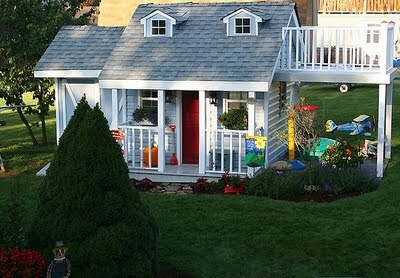 Playhouse to build… you vote. We are considering building a playhouse for the boys this spring.Â Here are a few that I have found that I like.Â Thoughts??? 3.Â Click HERE to see more of this design. 7 Responses to Playhouse to build… you vote. Oh my heck…I guess I would vote #3 since it looks the simplest and the least GIRLIE! CRAZY!!! I love you hon, but please, please, please keep it simple. As a mom of two boys, I vote for #3. Make sure the colors are manly! I am a horrible friend. Sorry I haven’t called you guys in soooo long. I thought I’d check your blog to see how you’re all ding. Wow, you’re busy people! Always taking on a new project. I love it… you inspire me! As far as the playhouses go, I’ have to say that #2 is my favorite. I think it would be awesome to slide out of my house! #3 is pretty cute too though. I don’t care which one you build, but can I play in it?